PFlex Aerobic 10mm increase the balance and absorbs the impacts against the floor, reducing the feeling of being tired and the risk of injuries because of jumping or falling. This is the best solution for Group Training with no equipment. It is available in a lot of different colours and textures like wood imitation, marble or metallic effects. Tiles are 100 cms x 100 cms and 10 mm thickness with four sides puzzle interlocking for an easy installation that you don’t need to glue to the floor. We produce straight edges, corners and transition ramps as per customer request. Designed for fitness areas with soft equipment. 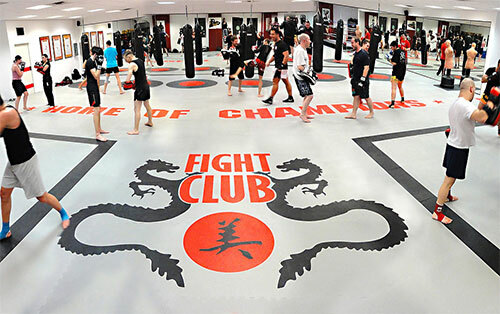 PaviFLEX Fitness 5 mm is exceptional flooring for soft equipment fitness areas. Developed for noise, impact and vibration absorption, we recommend to use in areas with soft equipment and soft dumbells. It is available in a lot of different colours and textures like wood imitation, marble or metallic effects. Tiles are 100 cms x 100 cms and 5 mm thickness depending on the quantity of people and intensity of use. With four sides puzzle interlocking for an easy installation, you don’t need to glue to the floor. We produce straight edges, corners and transition ramps as per customer request. 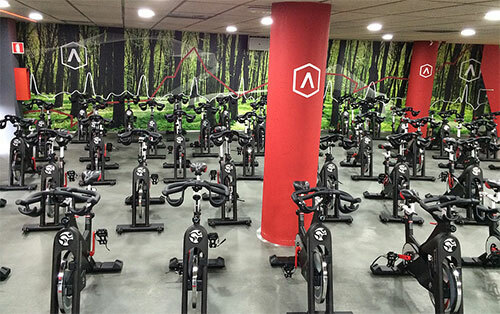 Designed for heavy equipment, indoor cycling, freeweights and functional training. 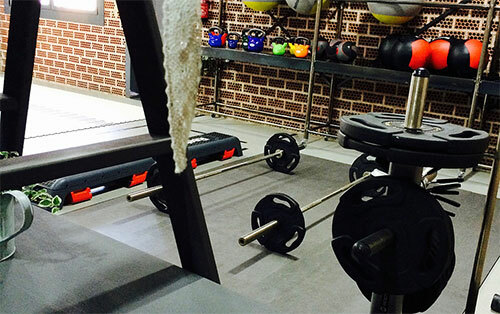 PGOM 5 mm / 7 mm is, probably, the best gym flooring in the market. It has been develiped exclusively to offer the best performance to the most demanding athletes. It is non-slip so it’s perfect for functional training. Its high density provides excellent properties of shock absorption and freeweight resistance. PGOM compounds reduce vibrations from equipment and make this floor perfect for intensive use. It is available in a lot of different colours and textures like wood imitation, marble or metallic effects. Tiles are 100 cms x 100 cms and 5 mm or 7 mm thickness depending on the quantity of people and intensity of use. With four sides puzzle interlocking for an easy installation, you don’t need to glue to the floor. We produce straight edges, corners and transition ramps as per customer request. 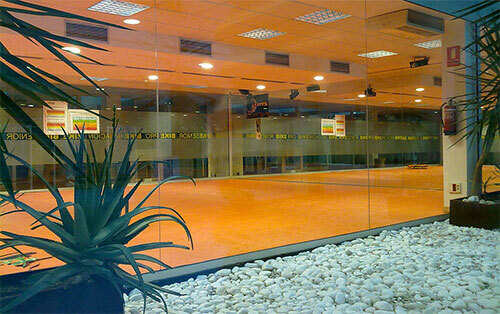 Developed for activities requiring the use of a padded floor: Stretching, Yoga, Pilates, BodyMind. PFlex Stretching 20mm has been specifically created for activities and exercises where it is needed to use a padded floor as a mat. It offers thermal isolation and it has a comfortable touch, providing the right balance between density and hardness. Excellent surface for stretching, Yoga, Pilates and Bodymind. It is the best solution for small places also where the athletes cannot use individual mats. It is waterproof and it is really easy to clean and maintain. It is available in a lot of different colours. Tiles are 100 cms x 100 cms and 20 mm thickness with four sides puzzle interlocking for an easy installation that you don’t need to glue to the floor. We produce straight edges, corners and transition ramps as per customer request. PFlex Tatami 20mm / 30 mm absorbs the impacts from the body when falling and returns the bounce. With a padded surface but solid for the right movements and the right support for the feet. It is totally waterproof and doesn’t absorbs any sweat. Really easy to clean. It is available in a lot of different colours and you can choose two different surfaces: plain surface and bubble surface for non-slip. Tiles are 100 cms x 100 cms and 20 mm or 30 mm thickness depending on the quantity of people exercising, with four sides puzzle interlocking for an easy installation that you don’t need to glue to the floor. We produce straight edges, corners and transition ramps as per customer request.